Stonemaier Games will release the Scythe Encounters expansion deck on December 7. 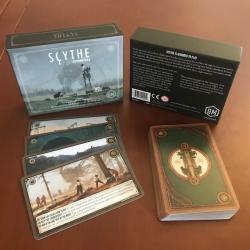 In the summer, Stonemaier Games held a competition inviting fans of its hit game Scythe to submit ideas for new cards for use with the game based on previously unused artwork by Jakub Rozalski. Scythe designer Jamey Stegmaier selected and developed his favorite submission for each card, creating an all-new 32-card encounter deck. This deck can be used to replace the encounter card deck from the base game or both decks can be shuffled together for greater variety. 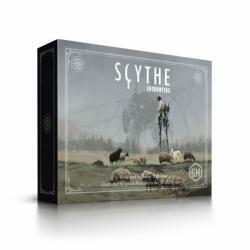 The Scythe Encounters deck will be sold as a boxed set with an MSRP of $20.00. It will be compatible with the base game and all expansions. Scythe has been a major hit for Stonemaier Games, holding strong at the #4 slot in ICv2�s list of top-selling board games last spring (see �Top 10 Hobby Channel Board Games--Spring 2018�), after spawning a trio of expansions (see �Final �Scythe� Expansion�) as well as a family-friendly version (see �Stonemaier Games Courts Families With First All-Ages Game�).